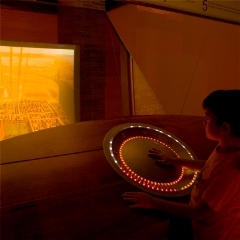 The museum is dedicated to the history of the city of Valencia, from its origins to today. At the entrance, after passing by the reception, you will find a floor plan that will show you where you are. The layout is simple, although the “forest” of pillars that fill the space can be disorienting at first. Read the history of the building (located in the menu above) if you would like to learn more about the pillars’ origins. 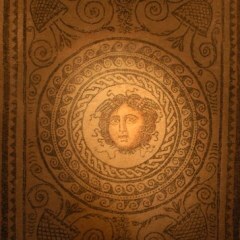 If you continue forward a few steps, you will see a beautiful Roman mosaic with the face of Medusa at its center at the end of the hall. It was discovered in a domus that was excavated toward the middle of the 20th century in the current street of Reloj Viejo, and it is the emblem of the museum. At this point you will be at the Ágora, or main square, of the museum. To your right you will see the permanent exhibits, to your front is the multimedia library (or mediateca), and to your left are the rooms for temporary exhibitions and multiple uses. The permanent exhibit begins with The Living Valencia, where various projections that depict the recent past of the city can be seen. Though here we can find the Time Machine. The time machine is located in the heart of the museum and through it you can experience the many faces of the city throughout its history. A grand voyage with intuitive controls, it allows you to select your preferred language and means of navigation as well. “Historic periods” surrounds you with the eight periods in which, in conventional form, we have divided up the history of the city, showing us the urban spaces that were the most remarkable in each moment and giving us context for each. “Key themes” addresses different important aspects of the city’s history, urban planning, economy, and society across successive historical periods. Finally, “summary” gives us an extensive panorama of the entire history of the city. 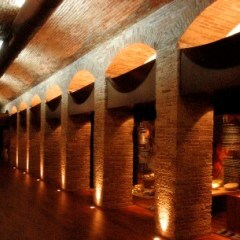 Continuing on, we can visit the permanent exhibition, which begins in the Roman era (Valentia). In each block we will find two sets and a series of vitrines arranged around them. Upon these sets dramatized scenes are projected that recreate daily occurrences from the past. In front of each one of them, a control panel explains the story being told and presents the characters; in the center, a permanent display allows one to select between different scenes. 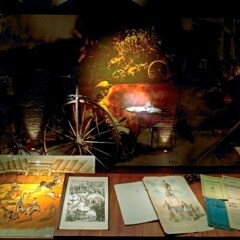 The vitrines display a wide Collection of objects, works of art, and documents that represent their time. Have a tour following the order described by the map if you would like to see the entirety of the permanent exhibition. If you would like a quicker visit, we recommend simply seeing the vitrines without pausing to observe the scenes.